The dedicated road sweeper is a kind of electric ride on sweeper. With a high-efficient drum-type filter and an automatic cleaning system, the MN-XS-1550 dedicated road sweeper is mainly used for outdoor cleaning by sanitation departments, cleaning companies, property management companies, colleges and universities, etc. 1. The international advanced cleaning and throwing technology is adopted in the dedicated road sweeper. And the utilization ratio of the dustbin can be 100%. 2. This electric ride on sweeper uses advanced high-performance and maintenance-free batteries, and those batteries have no leakage or harmful gas generation. 3. There is a longer distance between the chassis and the ground, and the main brush is quite simple and convenient to install and remove. The bass design is less than 62 decibels. 4. The sweeper's movement is only controlled by one switch. 5. The intelligent main brush and side brush can go up and down automatically. 6. 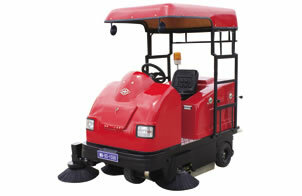 With a wheel-type dust bin, the electric ride on sweeper is convenient to clean. Nantong Mingnuo Machinery Tools Co.,Ltd is a professional manufacturer and supplier of dedicated road sweeper in China. They are mainly used for sanitation department, cleaning company, property management company and more. Apart from this dedicated road sweeper, we also offer all closed sweeper, sanitation street sweeper, multipurpose sweeper and industrial sweepers. With good quality and competitive price, our products have met the standard of ISO 9001:2000. With 20 years experience, the products from Mingnuo have exported to many countries, such as South America, Europe, North-east Aria and so on. If you are interested in our products, please contact us for details. 2. With a vacuum cleaning system, this multipurpose sweeper has no dust raising trouble.